Well it is shortly before 10PM and parts of the Northern Miami Valley have already seen a decent icing... as a matter of fact some schools have already canceled for tomorrow. The far northern part of the area is seeing snow, but a transition to freezing rain will slowly continue overnight. Good news for the Southern part of the area, the first wave of icing has missed you and came in from Indiana north enough to give us a little breather while the north wasn't so lucky. Darke County is already under a Level 1 Ice Emergency already, and I will be up in about 4 hours reporting on the weather.... from the looks of it, more than likely heading in that direction. Tomorrow's forecast still holds true from last post. Freezing rain will continue on and off through Tuesday night and a brief period of liquid rain may occur, especially south, Wednesday morning before temperatures quickly fall and we transition to snow and could see a couple of inches on the back side of the system on Wednesday. Strong winds and icy limbs and power lines do not make a good combination, so hopefully you have prepared for the worst, just in case. Time for bed if I am waking up at 2AM, be safe out there and have a good one! Not a lot has changed since yesterday, however there is one minor change... The switch from freezing rain to rain may be pushed a few hours into the future prolonging the icing. Some locations could see half an inch of icing or more here in the area, mainly the Northern Miami Valley. Power outages will be a big concern, so make sure to plan for that in advance. If you have a generator get gas, but if not, make a plan just in case you are out of electric for a few days. Hopefully you won't be powerless for that long, but its better to plan for the worst. Light snow/sleet arriving this evening. Snow/sleet will change to freezing rain from south to north, so the north could see a few inches of snow before the icing begins. Icing continues through Tuesday and as temps rise we will see patches of rain begin to mix in from south to north(midday-midnight). Temps will rise until around 5-7AM Wednesday then plummet through the morning. Strong winds, frigid temps, and light snow will be on the back side, the north could see a couple of inches, and the south right now looking at maybe an inch. I must also note I had to give in and get coffee this morning. I only got about 50 minutes of sleep last night, so I needed something to keep me going this morning. Oh well... I may be needing it for the coming days as well....who knows what my hours are going to be like. .It is going to get very dicey the next few days; be careful out there and have a good one. This system still could shift, but here is my detailed thoughts as of 6 PM Sunday. We will have a lot of moving parts and a lot of variations of precipitation. Light snow/sleet arriving Monday evening. This will transition over to sleet/freezing rain around midnight and continue on and off for the overnight hours. (The northern Miami Valley may see the snow stick around longer as their temps will be slightly cooler) On Tuesday, temperatures will slowly rise above freezing starting in the south and lifting north. Above freezing for the far south (meaning turning to rain) will be around the morning commute on Tuesday. Dayton area and areas along I-70 will get above freezing, (meaning turning to rain) roughly midday Tuesday, and the above freezing line reaching the Northern third of the Miami Valley by the evening. Temperatures will remain above freezing into early Wednesday morning until around the morning commute then they will plummet and fall below freezing quickly during the morning hours. Once we fall below freezing Wednesday we will see the possibility of the rain turning over to an inch or two of snow (maybe more north), along with strong winds. The Southern Miami Valley could see a light icing, around a quarter of an inch before the rain arrives Tuesday morning. Of course this system could still shift slightly, but recent models are starting to agree on its path. I will be back on to update any changes. I will also be on in the morning doing the morning show, so I will be sure to give you a Monday morning update regardless. Stock up and have a good one! Several reasons to be upset with computers.... first of all... I was trying to edit my story that is airing next week on Bellefontaine, since we are there for Where You Live. Well it turns out that that folder has been open on some computer for a week and I can't figure out where. I checked all the editing systems and I can't find any that have my folders open. Regardless, I missed the little red locked padlock and I didn't realize until I finished editing the video and tried to save and it crashed the computer....so I lost it all. (When it is opened somewhere else, it can't save the other opened file) It has to be some ghost computer, but anyway.... I will try again tomorrow or resort to other methods to ensure it works properly. Monday night looks to start out with a little snow turning to freezing rain and sleet for the overnight hours, which means Tuesday morning will be bad on the pavement. With the low tracking this close, it is likely that we will see a little rain sneak in as well on Tuesday. This will change back to another round of light icing then back to light snow showers once the low pressure moves away with frigid temperatures and strong winds. The ice band will be from southwest to northeast and the area just north of the ice band will see a significant snowfall. This system looks to bring a lot of moisture with it, so if you REALLY want a lot of snow, pray that the low pressure pulls farther south. Regardless, I will be back with an update, so check back. Until then, stock up on salt and have a good one! Well after a day eating doughnuts at work... yes, that is the story I managed to arrange, I came home to a delivery of my last moped parts to get it fully functional. Back to the doughnuts, the bakery is known all around the world. so when we do Where You Live, Springfield, you will get the idea. Got that done and came home for a little moped ride up the block and back and it was great, cold, but great! All the pieces are back in running well. I am going to wait to really take it out though. I need to run it about 300 miles to really break in the new cylinder...don't want to blow up the engine. Anyway, now that that engine is built and the other moped needs no work at all.... I will be laying low on the moped scene until the snow melts. Speaking of the snow, we did see that snow I mentioned before I peaced out to go to bed last time. We only got about an inch here at the house in Dayton, but off to the north they saw close to 2" in spots. Our next system that needs to be watched is next Wednesday.... my birthday of all days... I sure hope I don't have to work... We will be right on the rain/ice/snow line so it will need to be watched closely. As for today...I am off already, 5 PM, and I normally do not have Friday nights off so Dawn and I are planning a fun little evening. See ya back on here tomorrow and have a good one! After about 3 hours of work yesterday and about 4 hours of work today....I finished. It went surprisingly well because I took a lot more time than probably needed to check and double check before I put the parts back together. It turns out the carburetor shim was only 1 mm and I need 1.5mm so I had to order another one, but luckily they are only a couple dollars. I will have to wait for that to actually try and fire up the engine but I feel very confident it will run....and run much smoother than before with the new bearings and seals. I guess I might have finished it just in time because I am starting to feel under the weather. I am finishing this post then heading to bed to try and rest up...maybe an orange beforehand. I just hope it's short lived, if I do get sick. I really hate getting sick (I really haven't ever met anyone who really enjoys it). Speaking of the weather... the latest models show that we may also see a couple of inches of snow Thursday night into Friday morning. I will keep you posted on it, but my head is splitting right now. Have a good one! What a great day! Off of work, spent some time with my good companion Jon Scott, who is now producing the most amount of news at work... he is up to about 12.5 hours a week.... WOW! So basically he is in charge of making sure that the entire newscast is written and in the correct order, as well as sitting in the booth and giving everyone time cues and running the show smoothly....and to think he used to be a sports director at our last job in Lima and I had to shoot football highlights for him... times change I guess. Anyway, we hung out and it was a good time. 33. Anticipating the Moped Coefficient is the best way to maintain punctuality and sanity. The moped coefficient is a number somewhere between two and forty-six. To find this number: (1) Estimate how much time it will take for you to repair/modify some part of your moped. (2) Time how long it actually takes to repair/modify that part of your moped. (3) Divide the actual time by the estimated time (#2/#1). Moped coefficients less than or equal to 1 are denoted with the letter "i" because they are imaginary and do not exist in reality. Anyway, I got it all done in a very timely fashion and had all the parts separated in about 90 minutes and it was just in time for my new parts to arrive. I did a bare fabrication where I connect all the parts losely to make sure I am not missing any parts and it all seemed in order and I am ready to reassemble tomorrow for real... but I have to clean the engine cases because they are covered in, what Linda Green calls, "scroop" (scum + crud + goop). I want to make sure it is all very clean before I begin to reassemble the motor. I know it will get dirty again, but might as well clean it up. Time to get ready to watch the Ohio State basketball game... I hate to say it, but they have to lose eventually and Purdue looks to be their toughest opponent yet. I just think they need to lose before the tournament begins. That is NOT when you want to lose your first game of the season. Go Bucks and have a good one! Well after working the last 14 days, I finally get some time off. Today I finished off the streak by working on a Where You Live story. It should turn out awesome. Anyway, I got a LOT of plans for the next few days. I first want to work on my moped motor because the new parts arrive tomorrow. I also have to go to Mens Warehouse to look at tuxes for the wedding. I got a coupon for $40 off each tux and I am always looking to save money, not only for myself, but for the other guys in the wedding. I also have a lot of work to do around house that I have put on the back burner. One of those is spending time with Buckeye. Anyway, I just wanted to jump on real quick and drop a line. Temperatures remaining cold the next few days with little to no precip for the short term. Have a good one! After having such a hard time sleeping the last few weeks, despite being so tired...so I am cutting out the caffeine. I have only been drinking coffee in the afternoon, but still isn't helping me fall asleep...I used to be able to drink coffee and go straight to bed, but not anymore. My coffee mug will be filled with water instead, however the only problem is that I drink water soooo much faster. I feel like I am at the water cooler half of the day now. I keep trying to remember to bring in a water bottle into work, but I keep forgetting. Oh well, no coffee for me for a while...hopefully it will help me sleep better. I took all the weight out of the bed of my truck. It has only been getting around 13 miles per gallon with all the weight in there and it is KILLING my wallet. I normally can get much better, but with all the snow, I put all the weight in there to make sure I make it from point A to B without problems. It was also starting to slide around in the bed of the truck and that really was not fun...and I am sure not good on the truck. No crazy weather the next few days that I will have to worry about, so I decided I should take it out unless necessary. Speaking of the weather... Light snow tonight and tomorrow, only expecting about a dusting or so, but later tomorrow we will get slightly above freezing and could see the snow turn into a light wintry mix. The entire system does not have a lot of moisture, so any icing we will see should be light. Temperatures will fall early on Tuesday, so refreezing will be the main problem in my opinion. Tomorrow the light snow shouldn't really cause too many problems. Temperatures still sticking in the mid and upper 20's the rest of the week and really no major systems through next weekend. There is a weak system Friday into Saturday, but it looks like barely any moisture as well. Hopefully it is a sign that the snow is done for the year and we will see 60's soon....haha, I wish. Travel safe and have a good one! Last night we dropped to -7°F, talk about cold. Even Buckeye didn't want to stay outside more than a minute or two. Today we have stayed in the teens so nothing melting....and all I want is 40's so I can go ride my moped. Speaking of mopeds, my parts got pushed back a day by UPS... they are set to arrive on Tuesday now(my first day off in two weeks)...total bummer because we are one of the last houses on his route so our shipments never come until late in the day. I guess that will give me plenty of time to take apart my e50 motor and get it ready for the new parts. I am not sure what you would call my Thursday-Friday shift... a quasi-triple? 23 hours of work in a 34 hour span? Anyway, I only got a little over 2 hours of sleep during that span and surprisingly last night I came home and watched "The American" and couldn't fall asleep. I wanted to, trust me...my eyes were burning, half from being tired and half from standing in the blowing wind for several hours in the morning with wind chills around -20°F. That had to be one of my least favorite live shots only because of how cold it was with the winds. I stayed warm for the most part, but my face felt like it was about ready to peel off and my feet were freezing despite all the socks...better boots....birthday present to myself. Anyway, I slept like a baby once I fell asleep last night and now, I am back in the weather center again, and I really missed doing the weather on the weekends. I love filling in during the weeks, but the weekends just seem smoother for some reason. We have a slightly smaller staff: one anchor, one reporter(most of the time). That in turn means one less person here behind the scenes running the cameras, etc. Even though you would think the weekdays would be smoother with more people, on the weekends we all know our places and the ship seems to run so much smoother. Again, I am not putting down the weekdays at all, but on the weekend we all know our spots and work independently as a collective unit. We get our stuff done in a timely fashion and everyone has a little less detraction so it is easier to focus and the staff meshes really well. Another cold one tonight with a light dusting of snow possible north of Dayton, but more sunshine tomorrow with partly cloudy skies....so take the sunglasses with all the fresh snow. Light snow, and maybe a little rain, for Monday and Tuesday, but only looking at light accumulations. Temps remain "mild" for next week, upper 20's or low 30's. Until tomorrow, have a good one! Well it was cold this morning. While I was doing the morning reports it actually dropped down to around three degrees below zero for a while. Once you factor in the fifteen mile per hour winds, and it felt like fifteen to twenty below zero.... a wonderful way to spend my 11th straight day of work. At least the bitter cold kept me up and awake...no coffee this morning (rarity). I went to my good ole hometown of Arcanum since Darke County was the only county under a Level Two Snow Emergency....meaning you BETTER have an emergency to be on the roads. Rightfully so, the roads were really bad in the country and drifts were several feet tall on the north-south roads. The location I was all morning was only 300 yards from where my grandmother lived, so I stopped by her place for a quick hello and she was tickled I was just down the road from her all morning. It was good to visit her for the few minutes before heading out the door. Anyway, I spent my morning doing my live shots alone and I have a feeling that was a good thing....I probably would have came off a little cranky since I got less than an hour of sleep. Which brings us back to now...I am tired, no doubt, but I really have no desire to try and lay down and sleep. I know I need to run and get a dog tag for Buckeye. I have gotten his last two dog tags for Allen County, Shelby County, and now Montgomery County.... this dog gets around! I have had problems getting to sleep the last few nights, so maybe only getting 45 minutes of sleep will be the cure for that issue (creative thinking). It looks like we will barely get into the double digits today and a light snow is expected tomorrow, only around an inch...or less. There is another system that has been popping up on the models for Monday-Tuesday, but the models cant seem to agree on the system, so I will keep you posted. Have a good one! Well here at the station we have seen 6" of snow and it is almost completely over. The forecast held just as thought. The far Northern Miami Valley saw 2-4"....and the central and southern part of the area saw about 3-5, with quite a few locations picking up around 6". Now that it all has fallen, we have clearing skies building in. The combination of clearing skies and a very fresh snow-pack will allow temperatures to fall near zero overnight. In addition to that, another sweeping cold front is blowing across the upper plains with strong winds behind it at about 10-20 miles per hour, with stronger gusts. This will drive the wind chills to around -10 to -15 overnight and blowing and drifting snow will be a huge problem as well. I am set to be back at 4:30 AM to head to Darke County for live reports for the morning snow. They have about 6" of snow and since they are so rural, they always tend to get the worst drifting around the Miami Valley, so hopefully I make it there safe. Be careful out there, make the best of the fresh snow, and have a good one! 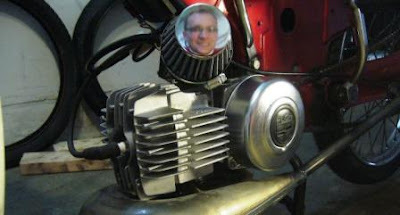 Feeling a little motivation with the snow starting...and getting all the stuff done around the house...I did the first necessary set for my moped engine rebuild: remove the motor. It only took about 30 minutes after disconnecting all the fuel, chain, wires, cables, etc. I also drained the transmission fluid and decided it is waaaay too cold to keep working on it in the garage so I am going to try and work on it inside on my Foosball table that has plywood thrown over it and a sheet.... We normally fold clothes on the sheet, but I will make sure to remove that and get a garage towel so I don't make a mess inside. The motor is caked with scroop (scum + crud + goop) from the riding, so I need to clean that off as well before I begin....parts should arrive Monday and I hope to have the time to break open the engine and get it ready for the rebuild. Have a good one! The grass is still showing through, but already starting to accumulate on the roads(only about half an inch so far). It will keep falling at a steady pace the next hour or so, and around noon until dusk some upper level energy in the atmosphere will move in and that will help intensify the snow, so that is when we will see the heaviest cells. Reports of accident across the area already....people just think they can drive like it was yesterday afternoon in the picture below. So take it easy, and I will be back on a little later...I got a lot of stuff that needs done around the house, including giving Buckeye a bath. Have a good one! First things, first.... The rain today was a nice change after the snow we have seen the last month and at least we melted the snow so we get a clean slate....however, temperatures look to fall below freezing before midnight.... This will cause roads to become icy as well as sidewalks. A decent fog had set up this afternoon thanks to the melting snow and light drizzle and this will stick around tonight. When the temperatures drop below freezing we could see a light freezing drizzle along with the freezing fog, so a light icing could great you tomorrow as you step outside so be very careful. While we could see a few flakes of snow tonight, little to no accumulation is expected....a dusting at most. Then cloudy through tomorrow and remaining cold so the ice will not melt unless treated....then the snow arrives. Right now the snow is slated to arrive around the morning commute on Thursday. By noon we could see around an inch on the ground and then in the afternoon we should get some upper level energy to help enhance the snowfall and by the evening we should see around 3-5". Lighter snow will continue into Thursday night and an additional inch or so could accumulate. Winds will pick up Friday, so blowing snow will be a BIG problem. To add to the problems, bitterly cold temperatures with the strong winds will combine and wind chills will be near or below freezing for the entire day on Friday and into Saturday. If the enhancement happens to arrive earlier we could be dealing with even more snow, so I will be back with an update tomorrow. Until then, have a good one! Well part of the area already seeing a bit of an icing, but I have good news. Temperatures will slowly warm up this tonight. A light wintry mix including sleet and a bit of freezing rain has already passed through the area. Light rain showers trailed the first round...depending on where you lived, it either froze if you were colder, or melted any ice from earlier if you were warmer. Temperatures are right at or above the freezing mark currently. As stated, we will slowly and steadily climb the thermometer overnight and top out tomorrow midday in the upper 30's. You can see the rain on the windshield as I was driving back from my dinner break. Light rain will continue off and on through Tuesday, but cold air will return in the evening and another round of wintry weather will be followed by light snow showers. With falling temps and the possibilities of a light dusting by Wednesday morning, take it easy on the roadways. Thursday we will see a decent shot of accumulating snow. While it is still pretty early to throw out numbers, it seems that we could easily see a few inches for part of the area by Friday morning. Winds also will pick up Friday so blowing and drifting snow will once again be a problem for the rural areas on Friday, as well as the bitter cold. We will see lows in the single digits entering the weekend...and of course with the wind, wind chills below zero. I will be back on tomorrow with hopefully forecasted snowfall totals for Thursday and any updates on Tuesday night. Have a good one! It is hard to believe that about six months ago I had four, but with time comes wisdom, and my good pal KZ had enlightened me.... quality is better than quantity. Now I can use this money for more useful things like new parts for the remaining two mopeds, and Dawn will smile if I put some of the money towards the wedding...(as will I). Anyway, the moped went to Jim from Michigan. He used to be into mopeds and moved out to Portland, Oregon and rode with the Puddle Cutters, but he sold his mopeds out there. He recently moved back to the Midwest and I am confident the Magnum went to a happy family because his only moped right now will be the Magnum....so I am confident it will get the TLC it may have missed out on here. Who knows, maybe at a moped rally soon, I can swarm with him and the moped.....Farewell good buddy. Also, as a sign of remorse, Dawn is wearing a Switch Hand Signal moped t-shirt.....a nice touch. It is a two foot spark plug with SHS labeled on the side. Switch Hand Signal is the moped gang from Pittsburgh, PA. Anyway..... I will have an update on the forecast a little later tonight. Well not that I wanted the Ravens to make it, or the Falcons, or the Patriots, or the Seahawks....but I would have rather had the Ravens advance than any other team. I am a Browns fan and I will despise the Steelers forever, but I do not like the Ravens either, however they were my last "hope." So now we are down to the Packers vs the Bears, and the Steelers vs the Jets... I have to go with the NFC and the Bears. The only thing I am worried about is how well the Packers have been...they are very streaky....they will crush one team then barely squeak by the next. If the Packers win against the Bears, they should own the Superbowl. Just another reason I want the Bears to pull through. So I have thought it over and decided to sell one of my mopeds. I currently have three and decided to sell one of them and use some of the money towards the wedding and some of the money towards parts for the other two mopeds to make them a little more reliable and help me get from point A to point B in less time. It was hard to come to this decision because I have always wanted this moped, but once I got it, I realized it wasn't as great as I had imagined. It is still a good moped, but my other two have found their niche in my moped desires and this third one would only get in the way or collect dust unless I had friends over to ride. It will be sad, but necessary. Tomorrow looks to be quite a nice day. Temperatures will get into the lower 30's in the afternoon, although it will be cloudy, but no precip arriving until after sunset. Temperatures will be right around the freezing mark so a brief period of a wintry mix is possible before light rain showers. That light rain will be on and off through out the day on Tuesday as we get into the mid and upper 30's. Temps will drop off Tuesday night as a cold front punches through the area and we could see another brief round of wintry mix with light snow showers. Right now little to no accumulations....only maybe a dusting. More snow will arrive Thursday and we could see light accumulations with this system, so stay tuned. Have a good one! Well after seeing mostly only snow the last few weeks, it appears our precipitation will be changing for the week ahead. Monday night into Tuesday temperatures will warm up to around the freezing mark and we will be seeing a wintry mix. The latest models show dry conditions for much of Monday and snow arriving in the evening and quickly changing to a wintry mix overnight. Temps look to remain above freezing heading into Tuesday so from that wintry mix we will see mainly just rain. Temps will fall back below freezing in the afternoon so we will see the rain change back to wintry mix and that to snow. Right now accumulations do not look too impressive, but we only would need temps to fall a few degrees in order to switch back to snow, so it will need to be watched closely. We will see another chance for light snow Thursday which will be the on-set of VERY cold air for the end of the week and start of next weekend. Temperatures will be the deciding factor in what we see Monday and Tuesday, so I will be monitoring the system in the coming days and updating the blog. A note I would like to pass along....I highly recommend NOT watching Man vs. Food when waking up. I was laying in bed this morning and turned on the television and saw that the series was stopping in Columbus.... I became so hungry that it was sickening.... I shoulda watched ESPN or something to motivate myself to workout rather than get greasy food.... Just a little tid-bit I wanted to pass along. Have a good one! It has been about a year and it was time again....dental visit. Some people hate dentists, but I honestly do not mind them at all. I have had two fillings, had my teeth capped, and had my wisdom teeth pulled, but I like going to the dentist. They hook you up with new toothpaste, a tooth brush and even floss, and I didn't even have to ask...haha. I would much prefer going to the dentist rather than the doctor. At least the dentist only has to deal with teeth and gums, they can pinpoint problems much easier...if there are any...which for me, there wasn't any...another clean bill of...teeth. Also, I will let you in on a little secret, Sidney will be highlighted in our Where You Live tour starting January 24th. I worked on one of the stories today, and it is going to be great! Just make sure you are not hungry when you watch this because if you are hungry, it will make you even hungrier. I am not sure what date my story will air, but get ready for good eating and a lot of good laughs. Well with all the recent snow, my school talk in Arcanum was postponed until tomorrow. I am rearing and ready for the weather talk with the seventh graders. I am also excited to see the new school that opened up just two weeks ago. I went to the old school my entire time at Arcanum, so I am interested in seeing the new building. A quick look at the forecast: Light snow over the weekend with only an inch or so... temps get close to freezing Monday into Tuesday and we may get above freezing long enough to get a little rain.....before more cold air arrives, but pretty quiet for the next few days, light flurries or light snow showers and remaining cold. Stay warm and have a good one! Right now most of the area has seen more than an inch or two, when I left work around 10AM, we already had about an inch and a half and there has been at least an inch since then and it's still falling. There is a "dry slot" moving in and this will give us a brief break. The dry slot is where dry air gets pulled into the system and will cause snowfall totals to get cut back. I still think 2-4" by this evening with more light accumulations overnight into Wednesday. Winds are not too strong just yet, but tonight that will begin to change and this snow is that light fluffy snow that will blow and drift very easily. Several counties are already under Level 1 Snow Emergencies, but I expect more and higher levels through tomorrow. Looks like a busy next 36 hours for me... if not longer. Stay dry, warm, and have a good one! Still looking at around 3-5 inches for most of the area with isolated spots north and west of Dayton seeing slightly more. The snow will arrive for the early morning commute and pick up in intensity through the late morning and early afternoon tomorrow. Roads are going to be pretty bad by the afternoon hours, so if you have to run out tomorrow to run errands, do it REALLY early or wait until late tomorrow, or better yet....Wednesday. Wednesday will have its own issues with increasing winds and also more light lake effect snow, so blowing and drifting snow will be a problem on the rural roads. As I had expected....I had my "weekend" rearranged this week, normally Tuesday-Wednesday. Instead I had today off and I will be reporting bright and early tomorrow morning for the entire morning show LIVE. The snow will still be light I expect for the start of the morning show, but by the time we wrap things up around 9AM (if we do not stay on later) the roads will start getting a little hairy....errr, snowy. Anyway, I am writing this at 9:38PM and I have to be back up at 2AM, so I will let you go. See ya on the morning show tomorrow, and have a good one! It is amazing how much time goes into even the basic of graphics to be built properly. I am a huge stickler on making sure that the graphic is complete and looks great before it hits the air, or the web. Well I have been re-working some of the web graphics on the weather page. While I hit a few snags along the way, I eventually got it all nailed down and finished. The weather center also had a few new monitors added two it for our ODOT cameras that we use during the show. The computer was normally placed in another location, but now we have a complete command center up here and it is pretty awesome. At first it was a bit much, but after I reconfigured some settings and got it all in running order, I became very excited.....sorry, I sometimes can be a complete electronic nerd. On to the forecast...Snow looking to return to the area early Tuesday morning. By the time we reach late Tuesday night, I expect around 3-5" of new snow. Light snow will continue into Wednesday but accumulations will be very light...winds will stay strong so blowing and drifting snow will be a problem as well for Wednesday. Since we have dealt with the snow already, don't be wiser than the snow because I would be willing to bet, there will be a slew of vehicles slidding off the road or into accidents. Drive safely and if the forecast totals change I will be back on to update them. Have a good one! Wooooaaahhh!! Now I know we, Dawn and I, winterized the house and did our best to try to save energy, but we still doubled our gas bill from last month! Granted, December was about nine degrees below average, and we had two and a half weeks below freezing....so I am pretty confident in saying that everyone's furnace got quite a workout to start off winter. I just can't wait until spring to see the energy bill go down, because I am all about saving money that doesn't need to be spent, and in my opinion, there are great ways to save money when it comes to heating and cooling your home, and I intend to use what I can, at my disposal. So, we saw a little snow the last 24 hours, about an inch or so. More snow will be on the way for Tuesday, right now looking at a couple of inches, enough to cause a few problems on the roads. Temperatures look to remain below freezing until next weekend so the snow isn't going anywhere. I will have forecast totals hopefully tomorrow, so far the models have been fairly consistent, but better to wait a little bit before sticking my head out there too early with snowfall forecast totals. I also am happy to announce that Dawn and I booked our honeymoon in Puerto Vallarta, Mexico....(wish I was there today) There are a ton of huge advantages to this place, one is that it's on the Pacific Coast so we will not have to worry about hurricanes(since we are getting married in hurricane season). I also get to finally use the Spanish I learned and school and at work(I probably learned more working with a few Spanish amigos than in the classroom) I am getting very excited for the trip, but still planning the rest of the wedding is quite a lot of work. I am still working with the florist and that is my next big thing... Yes, I am in charge of that still... No one likes my jokes about dandelions.... if we were having a yellow wedding I could understand, but who honestly takes me seriously when we are having a scarlet and gray wedding?! Wear the sunglasses the next few days with all the fresh snow and sunshine and have a good one! Been super busy today. The roads barely got above freezing so when the snow started to call this afternoon it melted on the surface and then refroze as the sun set and temps fell. Accidents all over the place and that is what I was reporting on tonight...the slick roadways. I will be back in early tomorrow to help with the team coverage for the funeral of the Clark County deputy. It will be a very sad day for her friends and family, as well as others across the entire state. From what I have heard, the turn out will be huge with support from a long ways away as the procession will have police from all over Ohio paying their respects. Light snow still overnight, but the main problem will be black ice on the roads. Bitterly cold and windy this weekend before more snow arrives early next week. Drive safe and have a good one! Well what a season...knock off the top two teams in the league, one of those being the reigning Superbowl champs.... and still end up 5-11.... How does that work out? I can understand baseball because that is a little different, but football is more of a lengthy team sport. I dunno, but I got a strong feeling that Mangini may have coached his last game today. Time will only tell, but I heard that he is meeting with Holmgren tomorrow, so we may know sooner rather than later the steps getting ready for next season. I got a feeling next season will be better. I am pretty sure most of you in the Miami Valley have heard the incredibly sad story about Deputy Sheriff Suzanne Waughtel Hopper out of Clark County. What a tremendously heard-breaking situation for her family and others on the force with her. The worst part is that she was defenseless at the time when the gunman took her life. My thoughts and prayers are with her family, friends, co-workers and also those surrounding German Township Police Officer Jeremy Blum, who was also shot in the shoulder. May he recover soon and may she rest in peace. A quick look at the weather, remaining cold the next few days, highs in the mid 30's and plenty of sunshine. The possibility of a light snow will present itself at the end of the week, but accumulations look light. That will be followed by a cold blast of air for next weekend with lows back in the single digits. Stay warm and have a good one! 2011 is finally here. I hope to all my readers that it turns out to be one of the best years ever. I was able to ring in the new year with a few friends, but not before a very active day. I woke up about 1:30AM yesterday morning to do the morning weather. Went home, took a 90 minute nap, then Dawn and I went to the Nutter Center to watch the Harlem Globetrotters. I had never watched them before and they put on quite a show. I would definitely go back and watch them again. Dawn and I rang in the new year in Columbus and we stayed at my brothers' place. It is always a lot of fun to visit them because all of my brothers and I have such different personalities. This morning we went to meet her parents, had lunch, and did our Christmas gift exchange, since I had to work, and we had a great time. They also brought Buckeye back down and to say he was excited to see us would be an understatement. From there we came home and now I am back in the weather center. I will say, yesterday was FANTASTIC!! I honestly did not expect to get into the 60's, and I am pretty sure no one did. The cloud deck fell apart for a short time and the little bit of sunshine that we saw sent the thermometer climbing. Regardless, I think everyone enjoyed the warm temps......but......it had to end. Tonight we will dip back into the teens and the highs for the first half of the week will be in the low 30's and then 20's by next weekend. Little to no snow is expected thanks to the jet streams current path, our best chance looks to be Thurs-Friday, but that looks very weak. As a matter of fact, there looks to be little to no precipitation for the Miami Valley for quite a while, so the good news.... roadways should be dry and not icy or snowy. New Year, so ya gotta look at the positives. Have a good one!